Chicago Cubs fans may very well be cursed, but such things are meant to be broken. When the team sparked a rebuilding effort a few seasons ago, they looked for executives with experience in shedding the worst historical streaks of bad luck. That led them to Boston and Theo Epstein, and now Theo’s leading prospects out of a stocked farm system and onto the Wrigley Field diamond. Their latest top prospect just got the call for his cup of coffee. When you can walk to the plate in extra innings after a rough first five at bats in the big leagues and knock it out of the park with this sweet of a swing, it’s no surprise that fans get so excited to see you live. Meet Javier Baez; you’re going to be hearing a lot about him very soon. Baez followed this debut with an even better performance in his third and final game at Denver’s Coors Field: two home runs and four RBI to lead Chicago to a victory over the Colorado Rockies. When a guy with a slugger’s reputation comes along, you often expect to see him pulling everything out of the yard; however, Baez demonstrated with two of his first three career bombs that he’s disciplined and strong enough to push out a dinger to the opposite field. He did this in the MLB Futures Game over the All Star Break, too, so don’t think it’s a fluke. He’s dangerous in every trip to the plate, and even if a pitcher manages to keep him in the yard, Baez has sneaky speed on the basepaths that’ll be good for at least 20 steals/year. It hasn’t sent prices soaring, but we’ve seen a huge jump in the number of Cubs tickets being purchased on the resale market since Baez got promoted from AAA Iowa. In the chart above, showing how many tickets were purchased for the upcoming homestand on each day over the past week, you’ll notice an obvious spike on Monday which has continued through the week. Just from Sunday to Monday, there was an 80% increase in the number of tickets resold (1,724 to 3,116). The current average ticket prices and cheapest “get-in” rate for each of the upcoming seven games are listed below. It’s worth looking at how this volume stacks up to other Cubs home games this season. 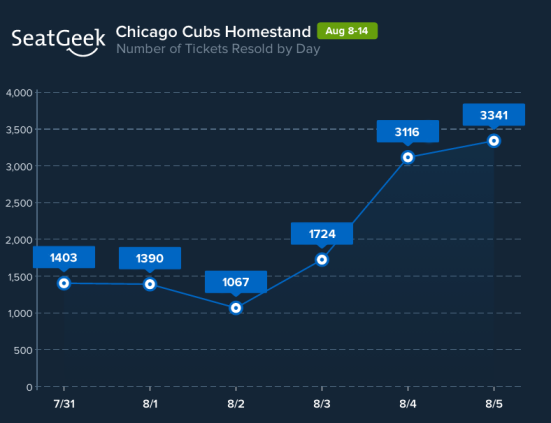 There were 1,550 tickets traded on Monday and Tuesday on the secondary market for Friday’s game, the second-highest total of tickets resold for a game at Wrigley this year on the third and fourth day before the game. The only game with higher volume in that period was the Saturday, July 26, Cardinals game two weekends ago (1,765 tickets). And yes, that means this beat out Opening Day resales 3-4 days before that game, albeit narrowly (1,532 tickets). Wrigley’s one of the most hallowed pieces of ground in the game; this is a pretty revealing glimpse into what a talented influx of youth has in store for the demand to catch the franchise’s resurgence first-hand. While two young veterans have been guiding the Cubs through the first stages of rebuilding, Baez and Arismendy Alcantara have been the first of a handful of even younger bats ready to join Castro and Rizzo in the Chicago lineup. This fall and next spring stand to be some of the most exciting times in recent Cubs history.